The yo-yo in its simplest form is an object consisting of an axle connected to two disks, and a length of string looped around the axle, similar to a slender spool. It is played by holding the free end of the string (usually by inserting one finger in a slip knot) allowing gravity or the force of a throw to spin the yo-yo and unwind the string (similar to how a pullstring works), then allowing the yo-yo to wind itself back to one's hand, exploiting its spin (and the associated rotational energy). This is often called "yo-yoing". 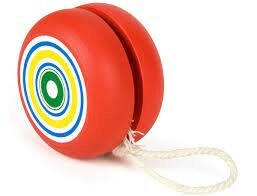 First made popular in the 1920s, yo-yoing remains a popular pastime of many generations and cultures. It was first invented in ancient Greece.